Although I feel a tad awkward writing about shopping after last week’s post, my original intention had been to start promoting my online store again toward the end of October. Unfortunately, the election overshadowed that initiative (even in within myself). However, with the Holiday Shopping Season about to begin (with Black Friday being this Friday and Cyber Monday this Monday), there’s no time like the present to let you all know what I’m offering through my growing online store. And honestly, though I have no intention of abandoning last week’s stance, it is healthy to take a break from all the negativity out there right now, and what better way than to buy something for yourself or a loved one and help support a talented individual, such as myself, in the process? 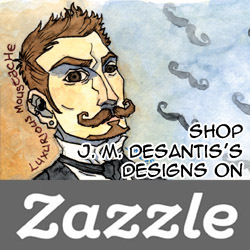 Right now my Zazzle store (found at zazzle.com/jmdesantis) carries over 75 products featuring at least 12 of my most popular designs and artworks, including 5 works from my Gentleman Cthulhu web-comic. I’d been working on the store silently (perhaps not the best of ideas) throughout the Fall in order to get some new designs and products available. 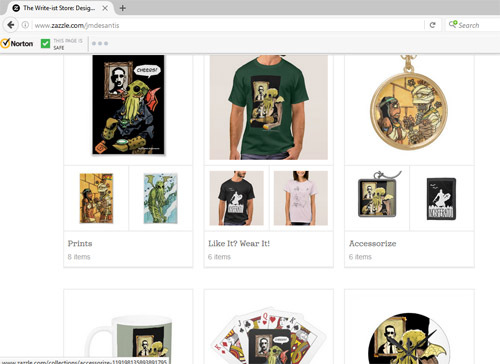 I also took some time to work on the design and layout of my store (as much as Zazzle allows you to control it) in order to make it easier to navigate. The introduction of Collections now allows you to shop products by certain types (in some cases the Collections are a blanket category for a variety of items). Though, of course, you can still browse by the designs offered (more or less) through the Categories option. That said, for my Chadhiyana fans, and as I’ve said in the past, since Rosarium Publishing still has exclusive merchandising rights to Chadhiyana, there are not any Chadhiyana products available. I know this is disappointing (for me too). Plus in respect of others’ copyrights, I only make available original works or those based on public domain works. Though as my Nosferatu, Lovecraft and Alice in Wonderland art are the most popular, it’s no loss there. That said, I’m certain Zazzle is going to offer a number of discounts on items through the season (they often do all year round). Right now, until Thursday, there is a “Black Friday” week sale. Just enter BLACKFRILOVE at check out and get between 20% and 50% off (depending on the item(s) ordered). Commissions are also open through the Holiday Season. I’ll only be able to take on so many, and already I’ve been approached by a few commissioners. So please contact me sooner rather than later if you’d like something done for yourself or as a gift for someone else. 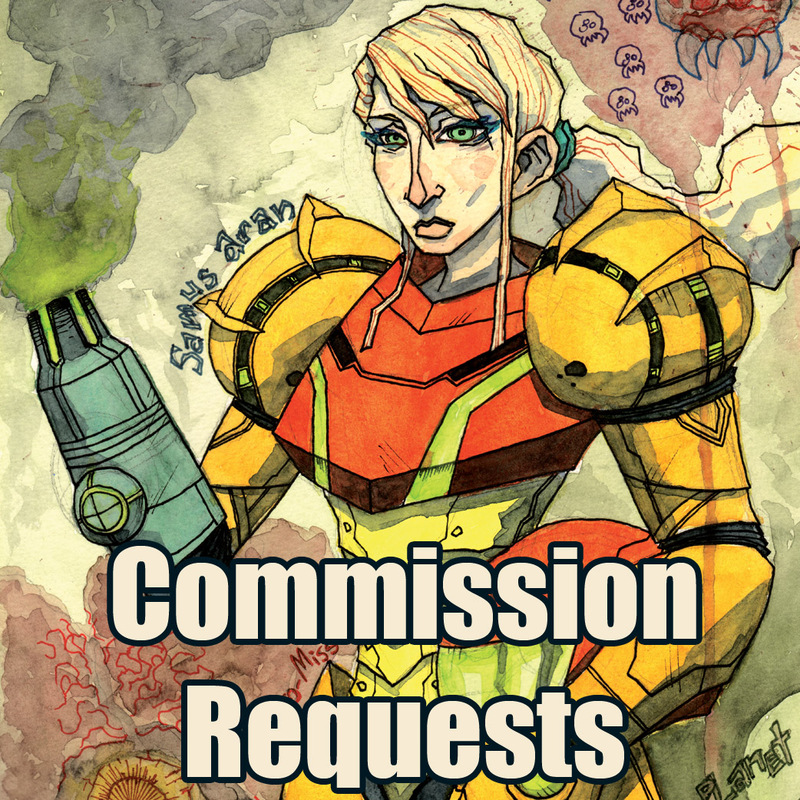 You can find all the information on the Commission Request Page (jmdesantis.com/commission-requests). I hope you’ll all give the store a look and purchase an item or two or consider a commission this year. Also, keep checking the store, as I’m planning to add a few new items before the end of the year, if time allows, and I’ll be sure to be a little less silent about it in the future. Thanks for the support, as always, and a (early) Happy Thanksgiving to all my American fans! SHOP J. M. DESANTIS THIS HOLIDAY SEASON!